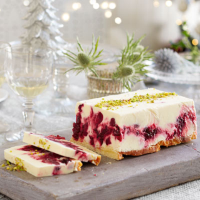 This stunning dessert is perfect for Christmas entertaining as it can be made up to 1 month in advance and kept in the freezer. 1. Place the cranberries in a small pan with 100ml cold water and bring to the boil. Simmer gently for 10 minutes until the berries soften and become pulpy. Stir in the sugar and continue to stir until it has dissolved. Simmer for a further 4-5 minutes until the mixture has thickened, then remove from the heat and set aside to cool. 2. Line a 1kg loaf tin with clingfilm or a strip of baking parchment that covers the base and extends up the long sides. In a bowl, whisk together the mascarpone and custard, then whisk in the limoncello (if using) and 3 tbsp of the lemon curd. 3. Spoon three quarters of the creamy mixture into the prepared loaf tin, then spread over the cooled fruit. Top with the remaining creamy mixture, then use a skewer to swirl and marble the cranberry mixture through the creamy layer. Smooth the top with the back of a spoon. 4. Thinly slice the Madeira cake and spread with the remaining lemon curd. Arrange the slices, curd side down, over the top of the final layer. Freeze for 5-6 hours, or overnight. 5. Remove from the freezer, dip the tin briefly into a tray of hot water and then turn the semifreddo out onto a board or serving plate. Allow to stand for 5-10 minutes, then scatter with the chopped pistachios and serve cut into slices. This recipe was first published in Wed Oct 02 15:05:00 BST 2013.